Caught between her Amish past and Englisch future...and in the crosshairs of danger! Growing up Amish, Deputy Becky Spoth never fathomed she'd become the target of a relentless stalker. She left her Amish community to serve the people of her small hometown - not to become someone's prey. Newcomer Deputy Harrison James is the only one who believes she's in harm's way. Now, her future is in the hands of this handsome stranger. 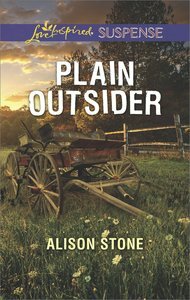 About "Plain Outsider (Love Inspired Suspense Series)"
Alison Stone is Senior Lecturer in Philosophy at Lancaster University.